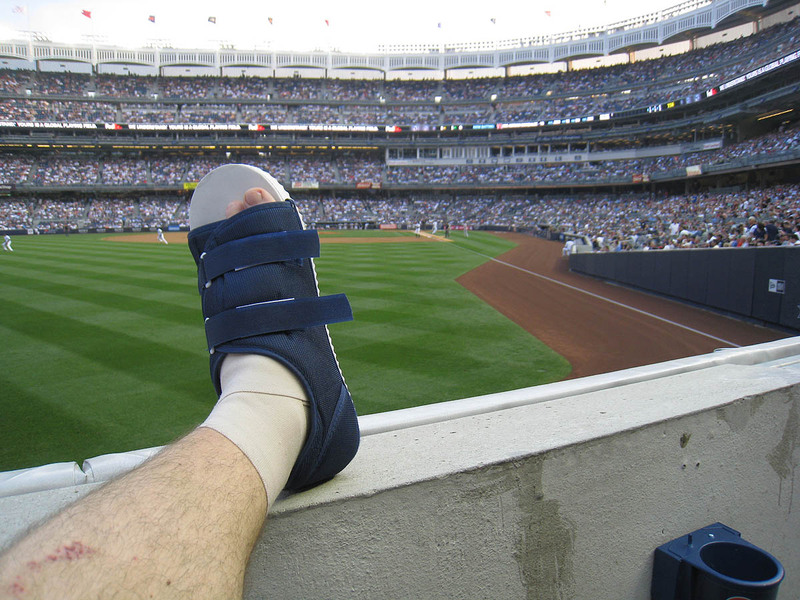 My ankle was (and still is) in such bad shape that I was nervous about attending this game — and if the MLB Network didn’t need me to be at Yankee Stadium, I would’ve stayed home. As I mentioned on Twitter several days ago, a crew from the Network came to my apartment to film me for a promotional segment sponsored by Sprint. At the end of this entry, I’m going to share some behind-the-scenes photos from that shoot, but for now, just know that (a) the segment had many parts and (b) some of those parts required me to attend this game. 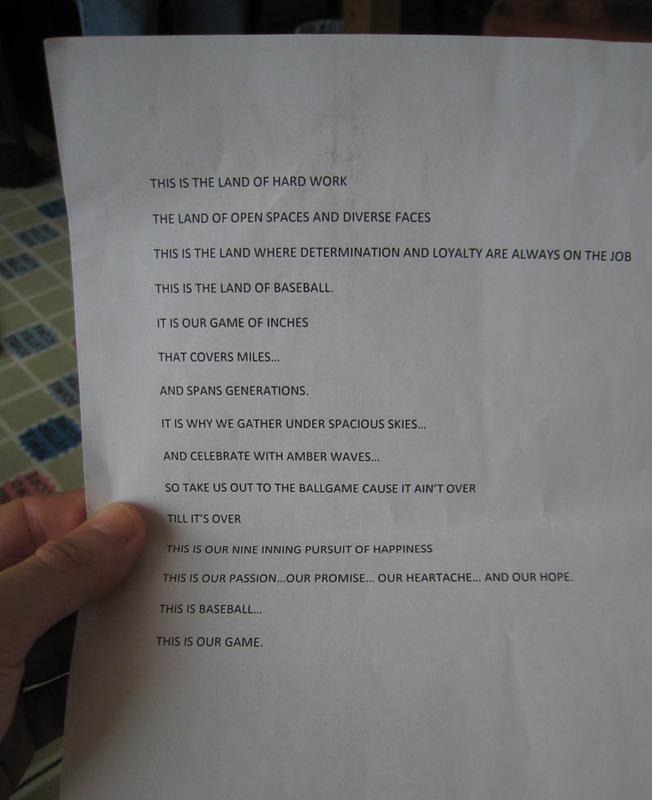 The translation is: “A baseball, please. I am injured, and I can’t walk.” And it worked. 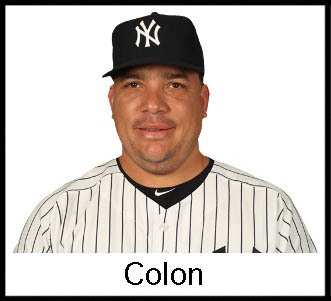 When I first hobbled into the stadium and made my way out to the right field seats, I got Bartolo Colon’s attention and unleashed my Spanish. Almost immediately, he turned and tossed a ball to me. Unfortunately, though, I was in the 4th row, and the ball fell a bit short. Thankfully, Ivan Nova hadn’t seen the other fan toss me that ball, so when I moved down to the corner spot near the bullpen, he entertained the notion of giving me another. What does that mean? Well, when he walked near me to retrieve a ball from the warning track, he held it up and asked if I wanted it. “Yes, I would love to have it,” I replied eagerly, somewhat surprised that he spoke English so well. “Will it make you happy?” he asked. Sweet Jeeeezus! 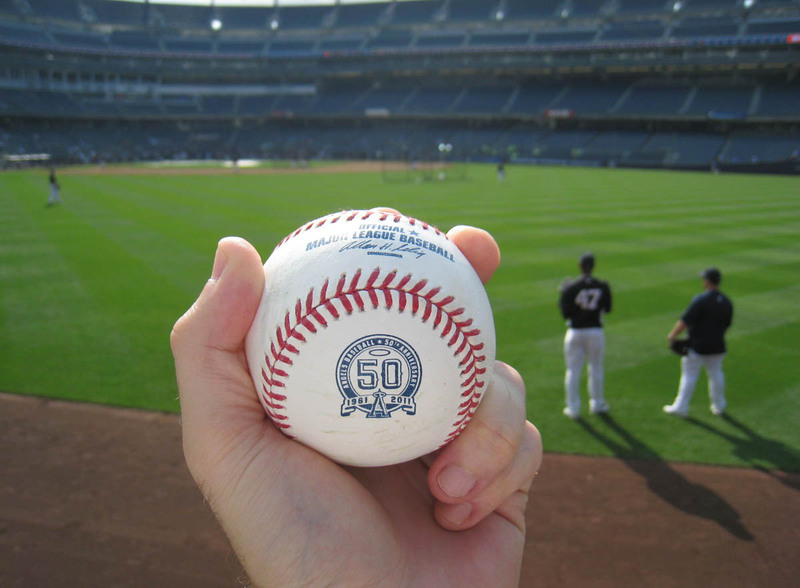 After two months, I finally had an “Angels 50th Anniversary” commemorative ball, and it was pretty much in perfect condition. Yes, of course! 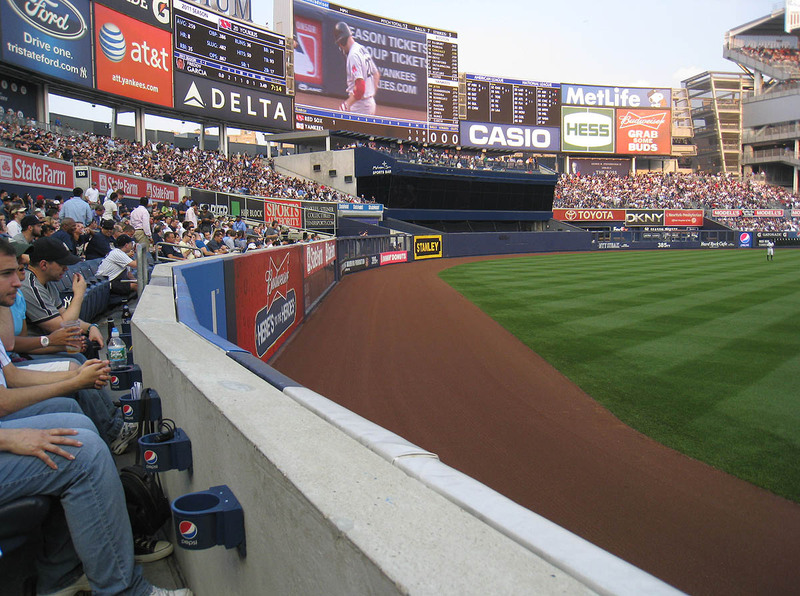 The Yankees had just played the Angels in Los Angeles of Anaheim. They must’ve brought some of these spacial balls back to New York. How awesome is that? Moments later, Mark Teixiera launched a ball that I quickly determined was going to land several rows back, so I hopped up several steps (on my good leg) and moved about 10 feet through the 3rd row. The ball landed between two seats and got wedged in the padding under the armrest. I hopped closer and snatched it just ahead of two other guys who were closing in on me — and it was another commemorative ball! Hell yeah. “What’s the total up to?” he asked. 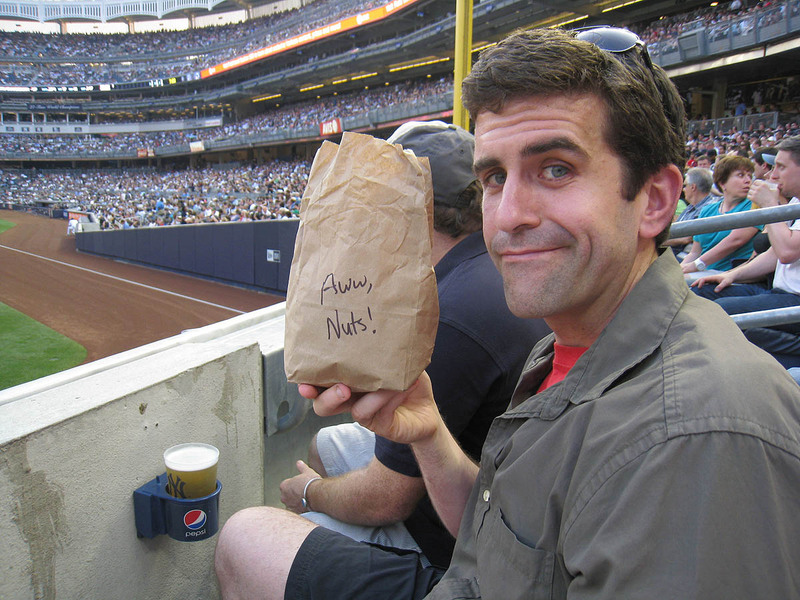 “Five thousand and fifty,” I said, including the two I’d just gotten from the Yankees. I told him that I’d brought a copy of my new book for him. “Yeah, it actually would be,” he said before thanking me. He’s such a nice guy. I hope he gets his ERA down into the land of respectability (it’s 7.31 at the moment) and gets his option picked up next season. In the photo above, do you see the player who’s walking to the left? There are four guys standing just past him. He’s behind the guy on the left. (Are you with me? Good.) That was Jonathan Papelbon, and he was heading slowly toward a ball that was sitting on the warning track in front of the bullpen. He kept walking. No eye contact. No smile. Nothing. He picked up the ball, looked at me with a facial expression that bordered on indifference/disgust, and tossed it my way. He responded with a subtle nod, and that was the end of it. 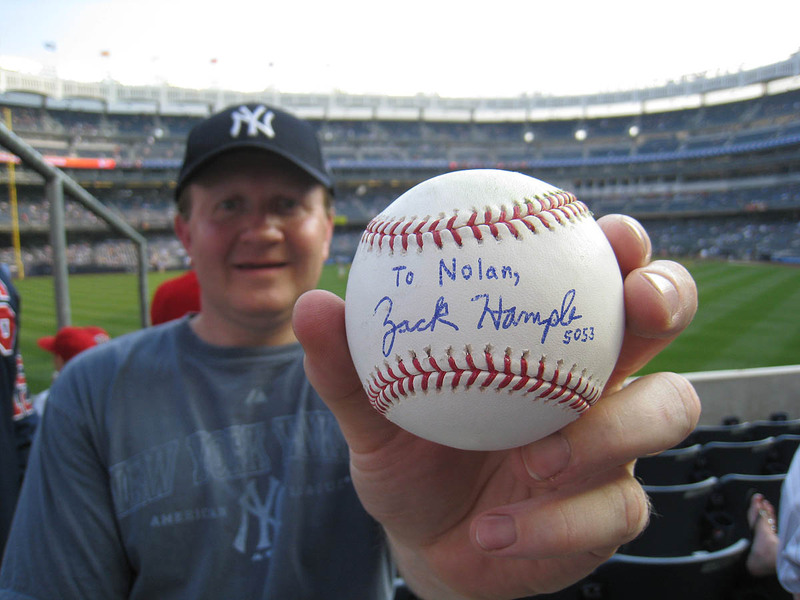 For the record, though, I really did want a ball from him, and I’m glad to finally have his name on this list. 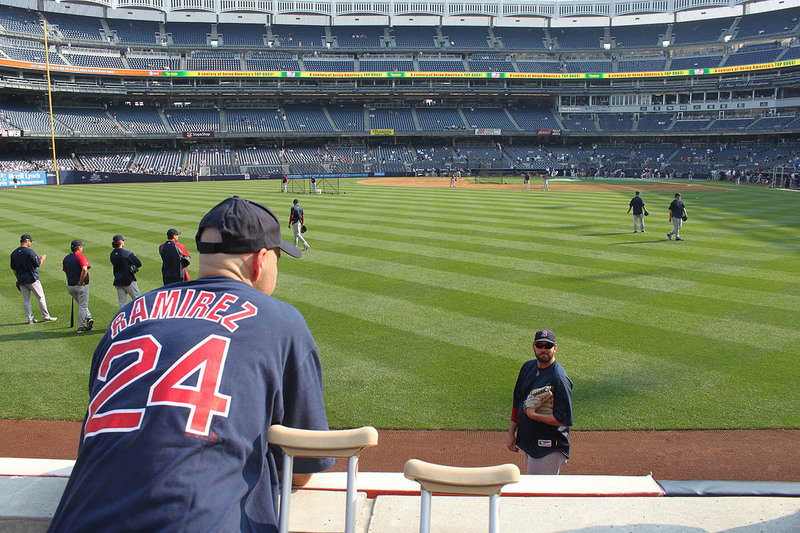 Soon after, David Ortiz hit a deep fly ball that was heading right at me. I wasn’t sure at first if it had home-run distance, but I could tell that it was at least going to reach the warning track. Ground-rule double? That was my first thought, but as the ball kept carrying, I realized that I might have a chance to catch it on the fly. At the very last second, I planted off my good leg and jumped/lunged over the wall. Then, while balancing atop the railing on my chiseled abs (umm, stomach), I reached as far out/down as possible with my left hand and made the catch. It was 90 percent luck and 10 percent skill, but it still felt good. 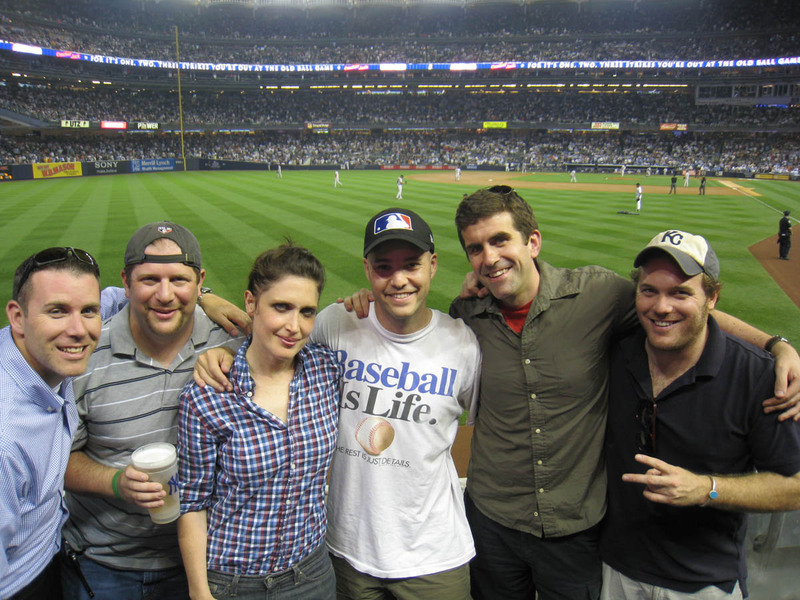 By the end of the 1st inning, Jona and I were joined by two folks from MLB — and their two guests. 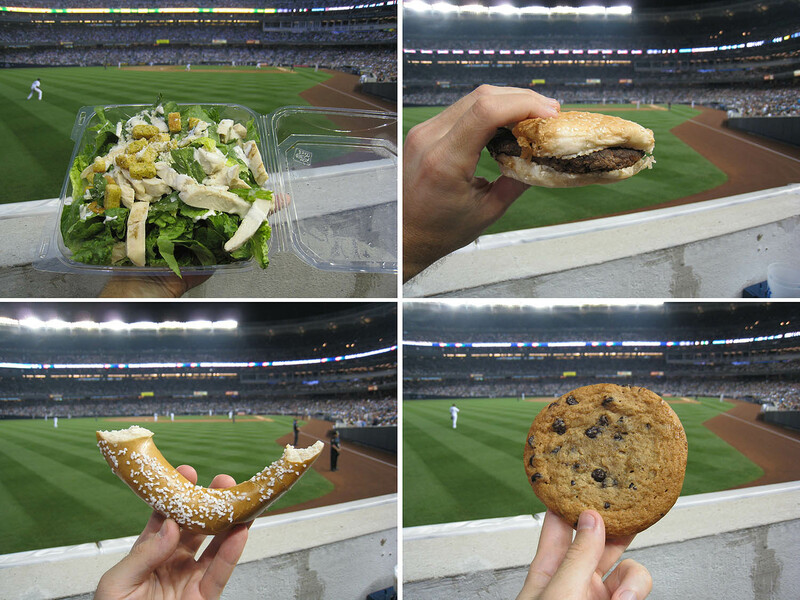 One MLB guy, nicknamed “Kope,” told me that he works in advertising and handles sponsors. 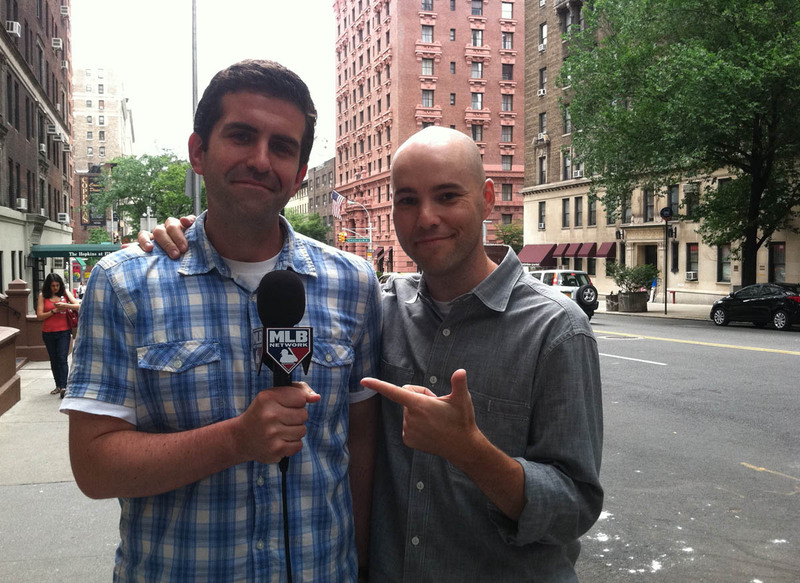 The other guy, Nick Stevens, is the one who’d interviewed me at my apartment. Talk about awesome jobs — he’s getting paid to travel the country and go to baseball games and interview other folks (like me) who’ve won the Sprint All Together Fan contest. USE MY POWERS FOR GOOD?!?! 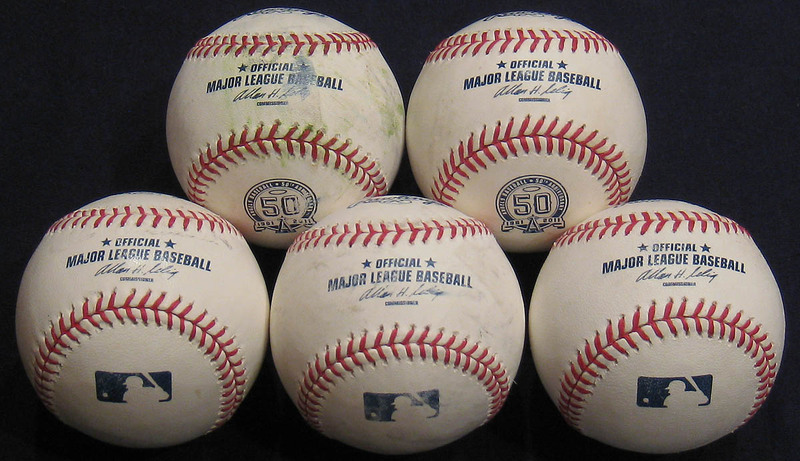 HOW ABOUT THE FACT THAT I’VE RAISED MORE THAN $16,000 FOR CHARITY BY SNAGGING ALL THESE BASEBALLS?!?! AND COME ON, I DON’T EVEN SPEAK PAPIAMENTU!!! Umm, I mean, thank you, MLB. It was very nice to be on TV. The security guards weren’t too happy about that woman sitting on the railing, although the on-field cop seems to have enjoyed the view. • 391 balls in 46 games this season = 8.5 balls per game. 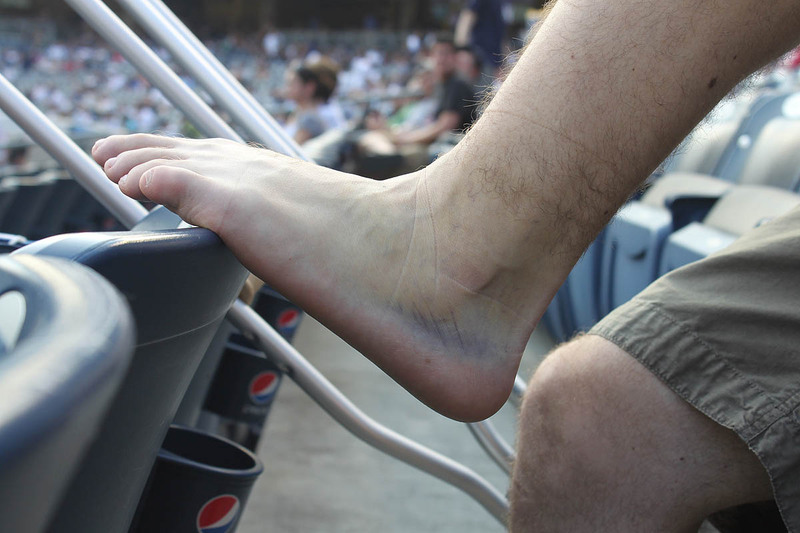 I had just sprained my ankle the day before, and it was still hurting like hell. 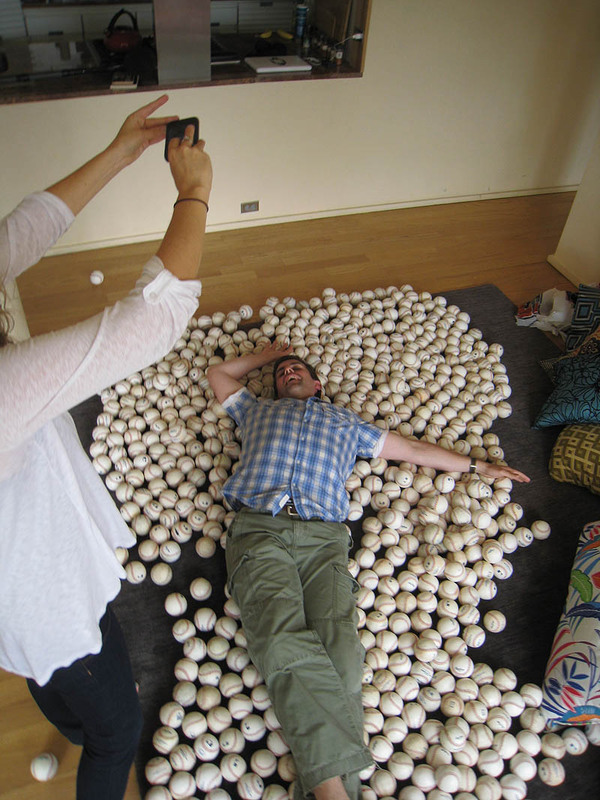 In the photo above, the woman kneeling next to the baseballs is Sadye (pronounced “Sadie”) Zillo. She’s married to Jason Zillo, the director of media relations for the Yankees, and she was producing this segment. The guy in the blue shirt, Dominic, was the camera man, and the guy in the orange shirt, Paul, was in charge of the audio. And yes, that’s my 231-pound rubber band ball in the background. Even though I’ve been interviewed a lot in the past, it never gets old, and I always have fun doing stuff like this. In the photo above, do you see those wooden benches off in the distance on the left-hand side? Well, after moving a few of them in order to recreate a miniature bleacher section, I gave Nick a brief tutorial on switching seats and improving his positioning in the stands. It was totally cheesy, but hopefully in a fun way. You can decide for yourself by watching the segment here. What an intense experience. Too bad the Orioles aren’t good enough to be a part of this series, or else I’d try to match your awesomeness. Hah. Congrats on all the fun stuffs. This is truly awesome, the whole thing with the MLB Network.. so cool you got to do that. Nice Segment! I was watching live on MLB Network when they showed you. Pretty cool to see you live on there. It’s been my dreams to appear on TV, but it seems to be easy for you. Congrats. And your blog entry wasn’t all that accurate. Before Ivan Nova tossed you the ball, he said something like “didn’t you get the ball (from Bartolo)?” You flat out lied and told him that you did not. 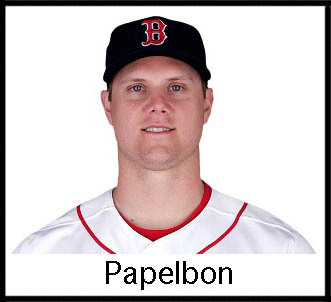 Papelbon isn’t the nicest of players in the first place, so his reaction was not very surprising to hear about. But he would not have tossed you that baseball had you not guilted him into it, saying that you couldn’t walk!! That was your choice to go to the game, no one forced you. Hahaha loved the interview. You and Nick did a fantastic job. 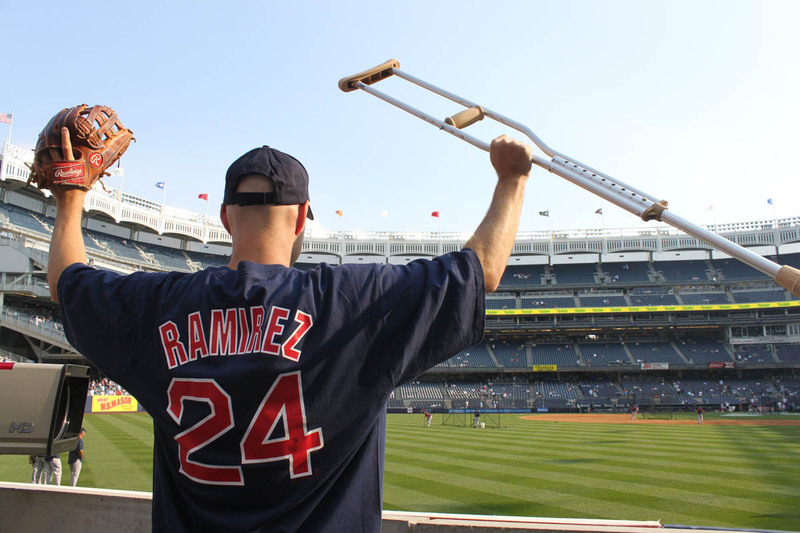 I’m impressed you still got five balls too, on a gimpy leg, at Yankee Stadium, during a Red Sox series no less. But then, look whose blog I’m commenting on. Does Wheeler know about your charitable efforts? Or is he just that nice? Oh and a couple Angels commemorative balls? You’ve got skillz man. Just wondering, how would C know what Nova said to you? Was he with you when you asked? Oh yeah i forgot Congrats on the commemorative balls. I got a 2008 all star ball at a regular game bp before. Thanks. Give it a few years. Maybe your O’s will be competing in the AL East. I know. I do feel very special/lucky to have been a part of this. Thanks. The ankle is slowly improving. As for being on TV, I happen to have a media-friendly hobby, so at this point, it does seem kinda easy to get on TV as a result. Of course I wish it happened more often, but I’m not about to complain. I appreciate the kind words, but I’m gonna have to respectfully disagree with you on the Nova situation. I’ve been asked by many players over the years if I’ve “already gotten a ball,” and not once have I *ever* lied about that. The most I’ll ever do is play it off by saying something like, “That must’ve been my twin brother,” but I do NOT lie in those situations. 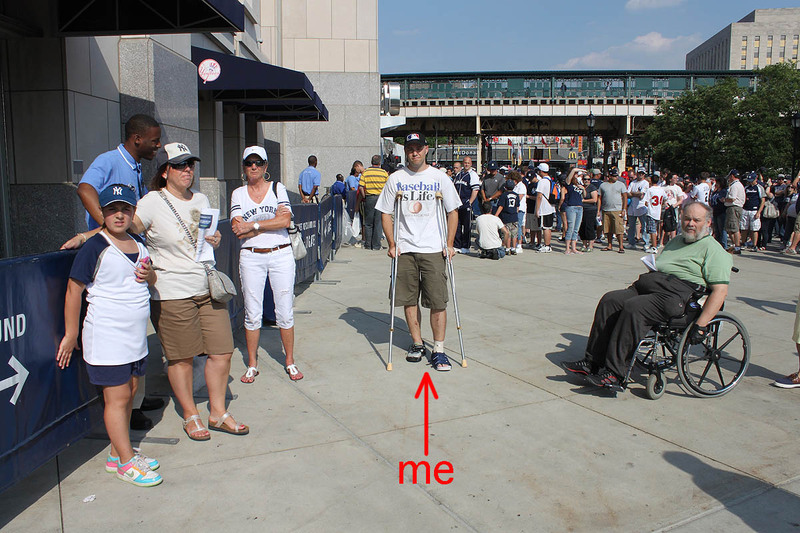 Yeah, I’ll wear gear of the visiting team, and in this case, I used my crutches to get some sympathy, but I don’t see the harm in that. (Do I know you, by the way?) I don’t know what you saw or think you heard, but as far as I can remember, Nova most certainly did not ask me anything about any other baseballs or about Bartolo Colon. I don’t know what else to say. Give me a lie-detector test, and I’ll pass it with flying colors, and in the meantime, I’ll just chalk this up as an innocent misunderstanding. Nick was fantastic. He could not have done a better job. Glad you enjoyed it. I’m not sure if Wheeler knows about the charity. I think I mentioned it to him a year or two ago, but I can’t remember. Zack, very cool interview, etc. I hope you recover soon! I remember Nick from when he tried out on ESPN Dream Job and he’s always been a cool guy to check out, with his Fitzy video clips, etc. I had never seen that old school pic with you in the Baseball USA hat before. Too funny, I also went to that camp probably around the same time. I think I went in 1987. Did they have any MLB players or coaches come to sign the week you were there? Floyd Bannister (pitcher on White Sox) was supposed to sign for us the week I was there, but he bailed so we got 2 White Sox coaches instead, Art Kushner and Doug Rader. Weak. Did you by chance ever get this tweet I sent you a few weeks ago? I asked if you used this scene from the tv show Still Standing in your latest book. Great blog entry, as usual. 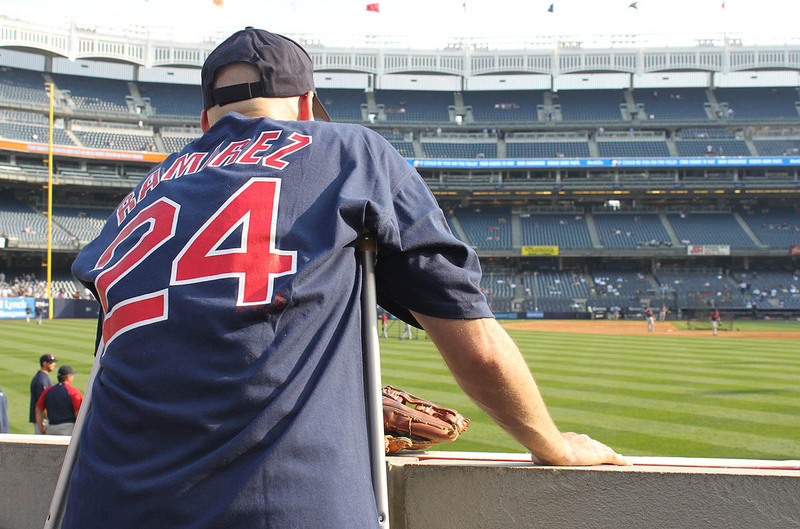 Will you be replacing your Manny Ramirez shirt with a……Johnathan Papelbon one? Heh…. 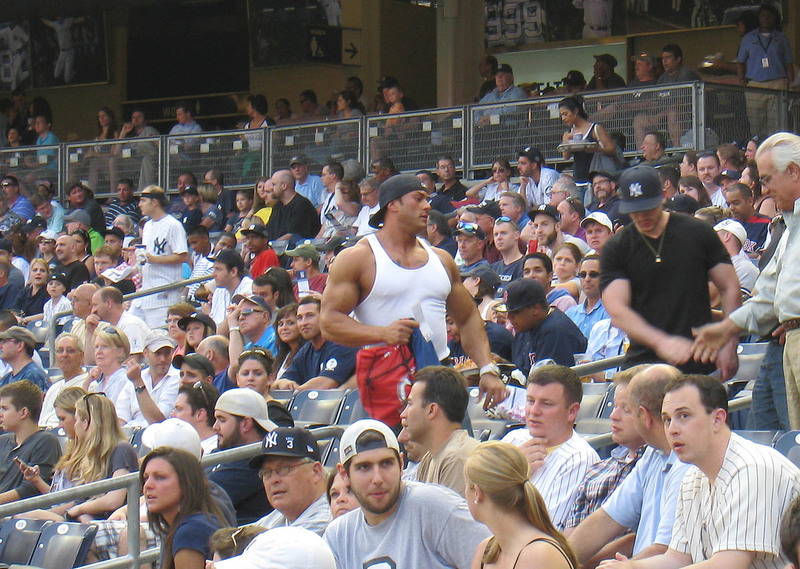 I KNOW what I heard Ivan Nova say to you…but that’s not what I wanted to focus my post on, so we’ll let that point slide. Sorry for making that appear to be the focus of my post. No need to give a “lie detector” test – we’re just having a discussion, it’s not a matter of guilty vs. innocent. 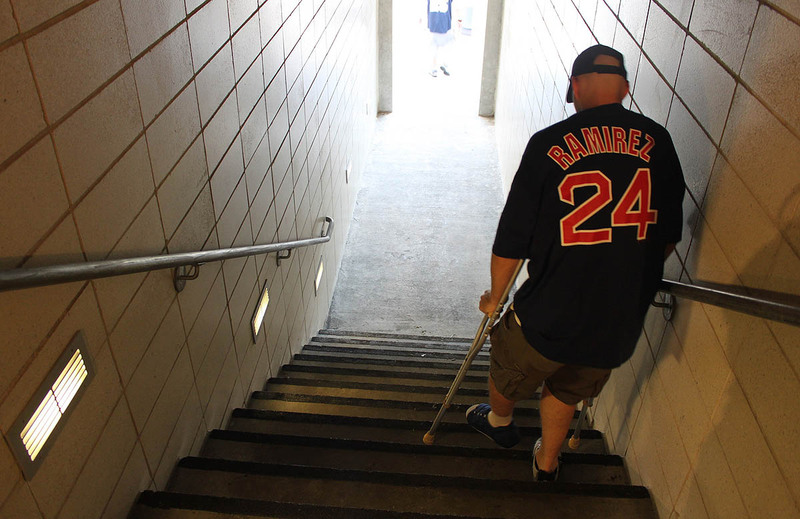 THIS IS WHAT I WANTED MY POST TO FOCUS ON – I just think you’ve reached a pretty new low to pretend that you’re a crippled person and use your crutches “garner sympathy” (as you wrote in your post and as I saw you doing at the game) to try to get a baseball to add to your collection. If you want to collect baseballs based on your skill (i.e. glove trick, ability to persuade players in numerous languages, athleticism to run around when you’re legs are okay, familiarity with the ballparks and recognition skills of the players, etc), then that’s perfectly fine in my opinion, and kudos to you. But to pretend that you’re disabled? I don’t know – I just think that’s a poor message to send and a bad decision on your part. And I’d like to think that you have good intentions – with your charity donations for baseballs caught and all…but I just think that’s really low and it was surprising to see you go that far. Saying that you can’t walk and holding up your crutches.. I have so much to comment on! First of all, as always thanks for the mention(s). I really appreciate you noting how I tried to get the other guy not to touch the ball tossed by Bartolo Colon. 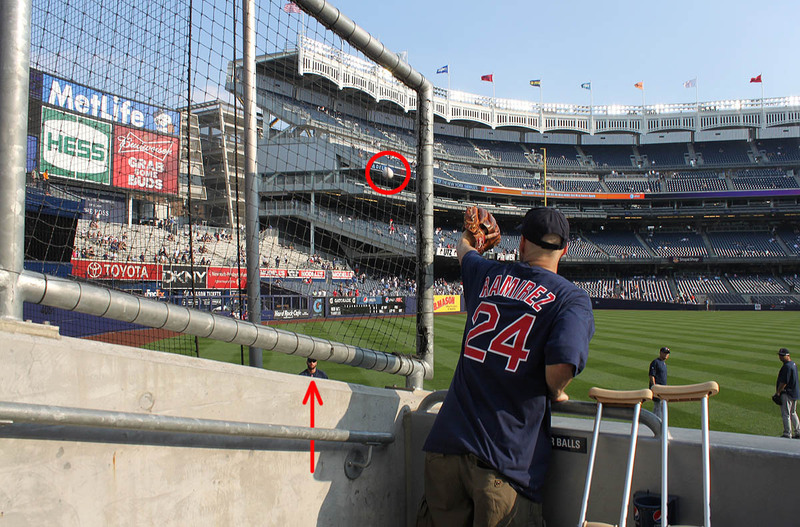 As for your catch next of Ortiz’s homer next to the Red Sox bullpen, I KNEW you wouldn’t give yourself enough credit! Don’t say it was 90% luck!!! As an able-bodied person, I don’t think I would’ve caught that ball. YOU, somehow, manage to balance yourself on one leg, enabling you to sorta leap out and reach over the wall to make that catch. It was AWESOME! 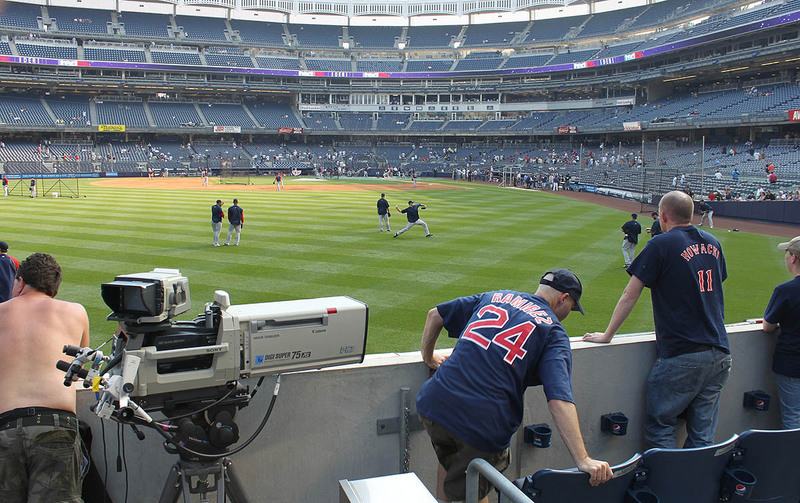 I remember the Red Sox pitchers out there were looking and a bit impressed as well. As for the segment, that was pretty cool! 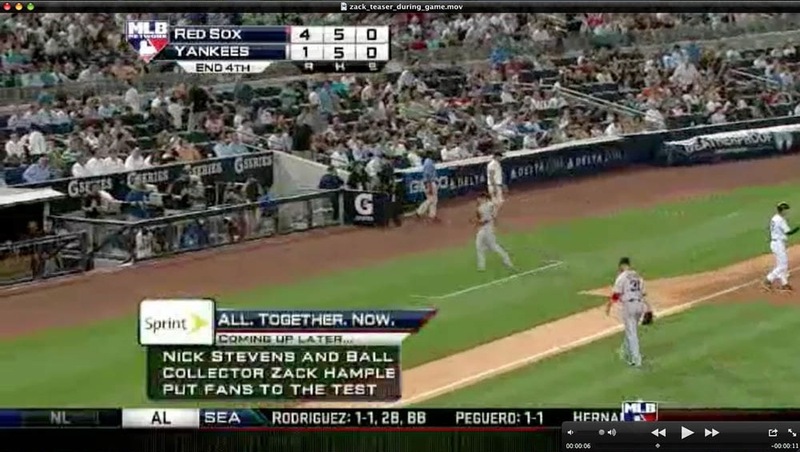 I do remember who Nick Stevens is now. I’ve seen him, I’m guessing on MLB. Someone mentioned in the comments he was on ESPN Dream Job. I TOTALLY forgot about that!!! I DO remember him from that as well. I thought it was really good. His Willie Mays catch thing was a bit cheesy, but other than that, I thought it was cool. 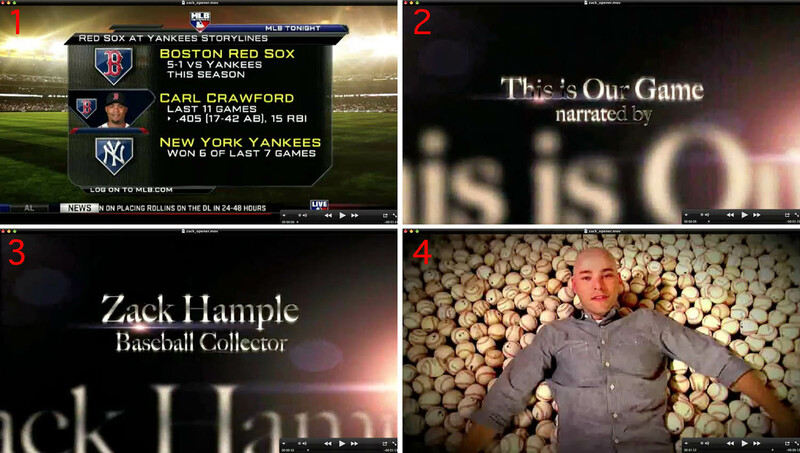 How many people do you think walked away from that game with 5 baseballs (which actually should have been 6)? 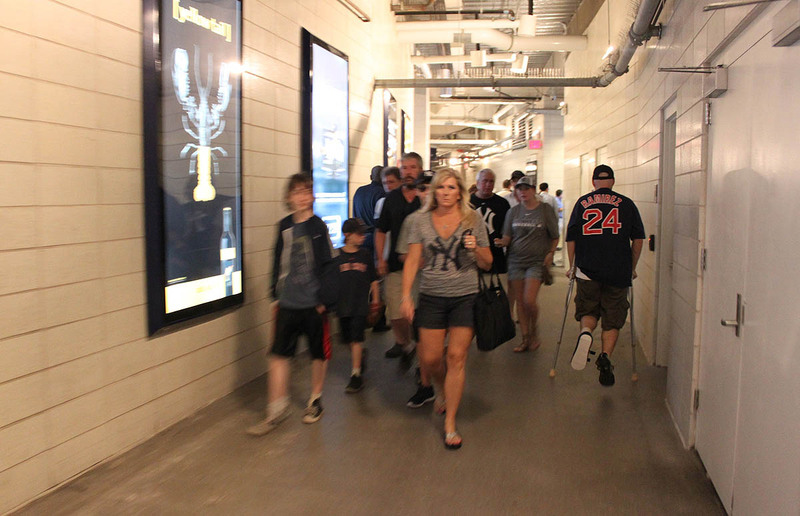 And this included a ton of people that came to batting practice and were legitimately trying. 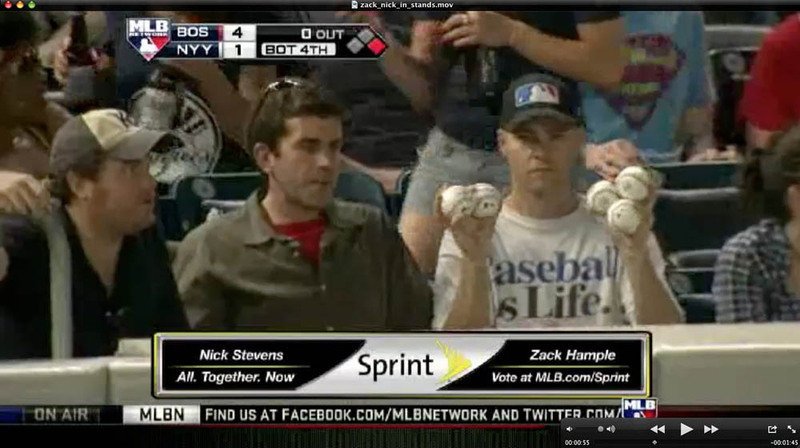 Maybe 1 other person in the whole stadium got 5 baseballs that day. 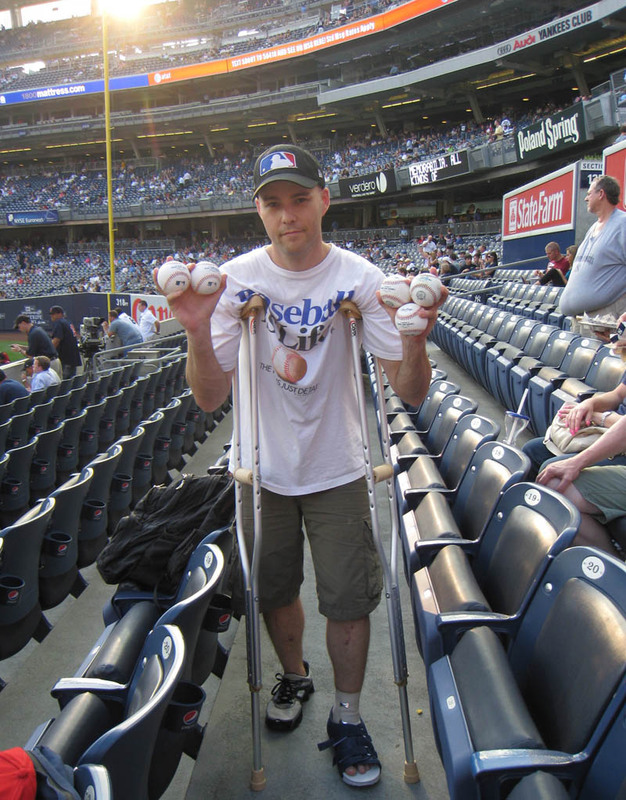 But SOMEHOW, even on friggin crutches, you manage to get 5 baseballs. Unbelievable. You are a man amongst toddlers. Ha, not sure about the shirt. I see the Red Sox on the road so rarely that it almost doesn’t matter. As for June 25th, that’s my mom’s birthday, and we’re actually considering going to Camden. It’d be a good excuse to hang out together, and she’s never been there. It’ll be a last-minute decision. I’m not pretending to be handicapped. The fact is: I can’t walk right now. 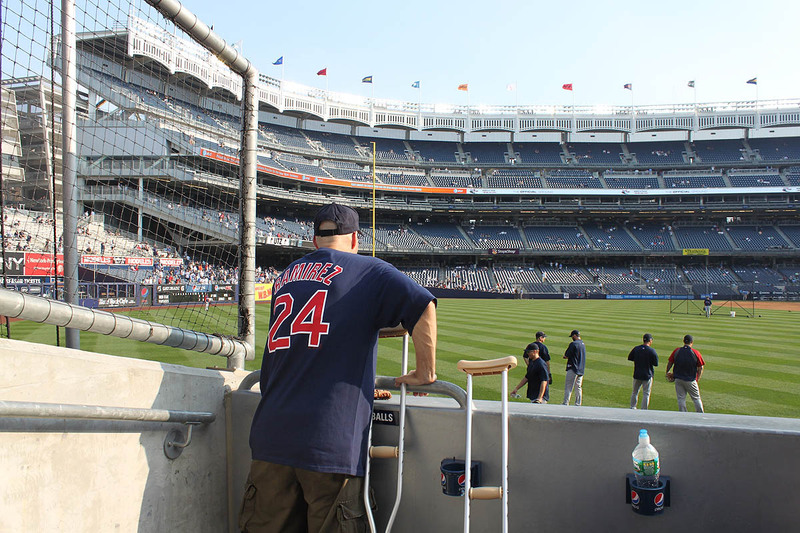 Using my crutches to get baseballs is no different from using a shirt of the other team to get baseballs. I’m just working with what I got — dealing with certain challenges while using certain things to my advantage. Sorry you don’t see it that way. That stamp is awesome and disgusting. Thanks for sharing that. Thanks! I hope you get one of those balls too. You are too kind. Thanks, as always, for the great comment. Zack…I am impressed with the catches despite the mobility issues! Need to ask… what is your pillow collection up to? Katie read the post, saw those pillows in your place and “digs”‘you even more ’cause she too has a love for a pile ‘o pillows. Seriously, the woman spends a portion of her discretionary cash on designer pillows each month! Nice entry Zack! This one has it all. Pathos, comedy, romance… or at least that creepy knee toucher guy… Egads! It’s Ben, the boy you met at the Yanks Sox game in left field. Congrats on the interview. It was my first day ballhawking, and based off of your techniques, i got 13 balls! 5 had the Angles symbol on it! Thanks a lot for the advise, and I hope to see you at a future game! Wow that guy was right, this is really low. 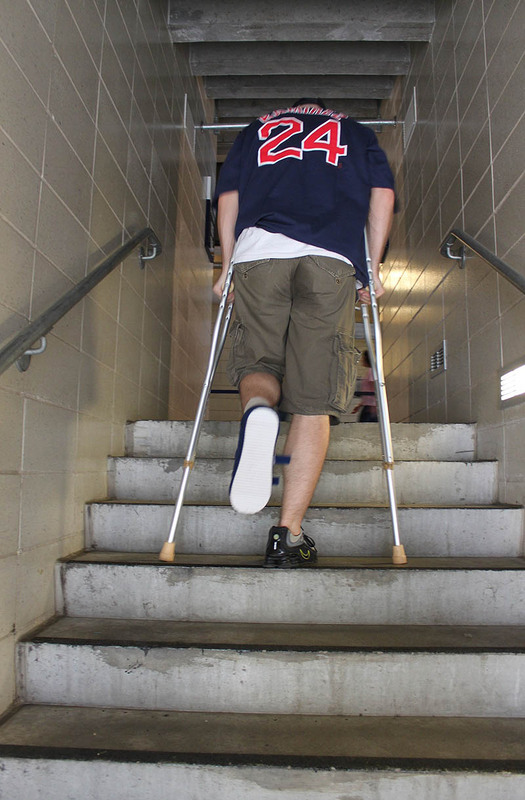 I mean come on man, either stay at home or don’t use your injury as an excuse to get more baseballs. Your “injury” isn’t even that bad, it might hurt but nothing’s actually wrong.